This is what it looks like when a plan doesn’t work out. The Arizona Diamondbacks, angry with the Brewers for a variety of reasons, and with Ryan Braun for some very specific other reasons, finished a passel of business Tuesday in the span of two pitches. 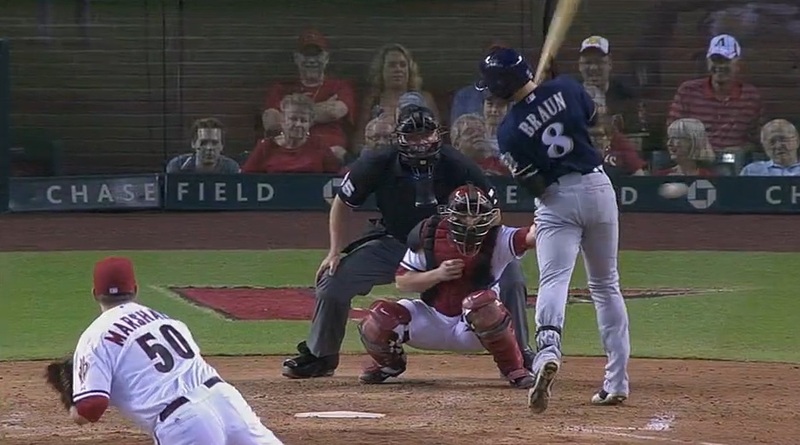 The first sailed behind Braun, the next drilled him in the backside. Milwaukee’s response: Hit ’em where it hurts. By itself, this may not have been enough to fully rile the D-Backs. But when, two batters later, Lohse threw a slider over the head of pitcher Mike Boslinger—who was trying to bunt Owings to second—Arizona took note. This pitch, too, was almost certainly unintentional. Why would anybody want to drill the pitcher in a two-run game? Much more likely, Lohse was trying to put a pitch in a difficult-to-bunt location. (In that, at least, he succeeded.) Add to that the fact that he grazed Didi Gregroius with a slider in the first inning, and manager Kirk Gibson’s mind was almost made up for him. The very next inning, he had what he must have felt was a tailor-made situation. Not only were there runners on second and third with one out, leaving first base open, but the batter was Ryan Braun. The same Ryan Braun who Gibson was not at all shy about slagging last year, in response to the fact that the 2011 NL MVP led the Brewers to a taut playoff win over Arizona, and later admitted to have been juicing at the time. The Diamondbacks have talked a lot of late about the need to stick up for their own in ways just like this, and followed up in as overt a way as he could. That’s the thing about planning, though—without execution, it doesn’t amount to a whole hell of a lot. The teams have two more games, today and Thursday, with which to continue sending messages. If Gibson’s astute, he’ll recognize not only that he took his best shot (two of them, in fact), and that it didn’t work out so well for him. His slate should be clean. If the Brewers are astute, they’ll recognize that Lucroy gave them the best response for which they could ever have hoped. Even-steven, everybody. Now go play some ball. The main thing I’ve learned is that Kirk Gibson is a bigger jerk than I thought.